Architecture and designed landscapes serve as grand mnemonic devices that record and transmit vital aspects of culture and history. 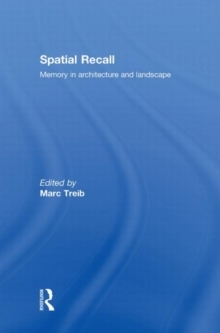 Spatial Recall casts a broad net over the concept of memory and gives a variety of perspectives from twelve internationally noted scholars, practicing designers, and artists such as Juhani Pallasmaa, Adriaan Geuze, Susan Schwartzenberg, Georges Descombes and Esther da Costa Meyer. Essays range from broad topics of message and audience to specific ones of landscape production. Beautifully illustrated, Spatial Recall is a comprehensive view of memory in the built environment, how we have read it in the past, and how we can create it in the future. Please note this is book is now printed digitally.